Camping is as popular as it ever has been, but there’s nothing like combining your passion for the great outdoors with a kayaking trip on the open waters. Kayaking is just an outstanding sport, whether you’re enjoying a quiet lake, a swift-moving river, or any other waterway. There’s nothing like paddling, floating, relaxing and fishing your favorite spot, cooking a meal over an open fire, and enjoying an evening out under the stars. Of course, if you’re a beginner there are things you’ll need to remember before taking your first trip. Check out this guide to canoe and kayak camping for the beginner, and learn about the best products for your first trip into the wilds and waterways of America. Kayak camping is more than hauling your gear to the water and going on a trip. In a true excursion of this kind, you use your water vehicle (kayak or canoe) to actually get to your campsite. You’ll travel the waterways, choosing a new campsite every day while you carry all you need with you. It’s a true adventure if you take the right preparatory steps. While canoes and kayaks use similar techniques to move on the waters, the two vehicles are quite different. Canoes are open vehicles that see you sitting up high, on a bench, and paddling with a single blade paddle. In a kayak, you’re sitting much lower to the water in a closed design, with a double-bladed paddle. In addition, canoes offer you more storage space for your camping trip, and they tend to be more stable—you can, with care, stand up inside a canoe without capsizing it. On the other hand, the extra storage space isn’t covered, so your gear will be much more susceptible to getting ruined by moisture. Kayaks are lighter, faster, and maneuver easier, but you can’t stand up inside them, and they offer less storage. Still, that storage they do offer tends to be more enclosed. You’ll need to consider your needs before making a choice. The first step in your outdoor adventure is to properly plan your trip. Carefully plan your route and if it’s your first trip, pick one that’s likely to be an easy ride, offering calm waters and relative safety. You can take more exciting adventures as you get more experienced. Keep it light and stressful, for safety’s sake and to maximize your enjoyment. Make a checklist of all the gear you need and all the steps you need to take and follow that checklist closely. Don’t be afraid to add to the list as you think of new things. It can’t be detailed enough. When you’ve gathered your gear, organize it and pack it, and go over it several times to be certain you haven’t missed anything. Be careful how you load the boat. The more you load it up, the more differently it will handle, and you want to be careful that everything is properly balanced. In addition, make sure that someone knows where you’ll be and when, and always go with a friend. Never go into the wilds alone. When you’re setting up your trip, it’s vital that you pick the right canoe. For more experienced paddlers, you might consider the ultra-sleek and quick Razorlite kayak. This kayak can get up to 6mph! However, we also recommend something from the Explorer series if you’re looking for something that can be paddled in both whitewater and flat water adventures. If you plan on camping, overnight trips or just plain need the extra storage space, the 420x is the kayak for you! 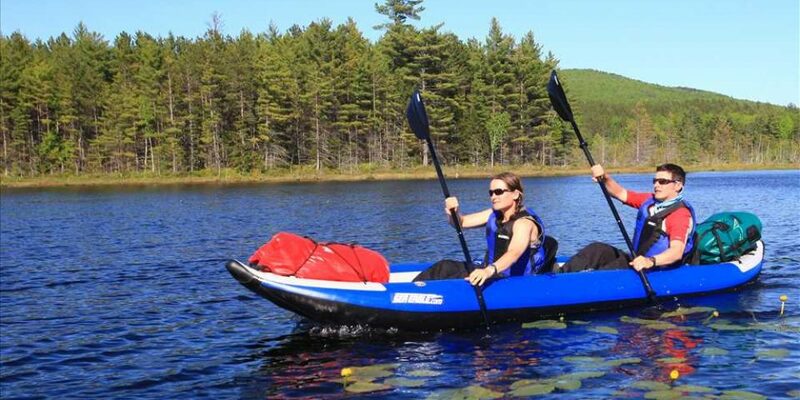 If it’s a canoe you’re looking for, check out the Sea Eagle Travel Canoe for your next trip, and check out our website for our full range of vehicles, accessories and other supplies to take your kayak camping trip to the next level.